It was the turn of the millennium. High School was an ugly interruption to my favourite spare-time passion – Anime. It was during these years, amidst the teenage-angst stage of my adolescence, that I found myself flying through a dozen series in a month. Fellow class-skipping otaku’s would greet eachother each morning by the cafeteria, and we’d debrief on the highlights from the previous night. Spike’s latest exploits in Cowboy Bebop. The genius works of Hayao Miyazaki. Goku finally reaching that Super Saiyan level that he’d been charging up for since last week. It was a different time. A few years ago, I set myself up with a Crunchyroll account. This was my chance to return to the land of Anime. To once again enjoy Frieza’s defeat on Namek. To trudge across the deserts of Gunsmoke with Vash the Stampede. To relive the Zaibach Empire’s war on Gaea. But alas, the allure of Netflix and other streaming services thwarted my efforts. 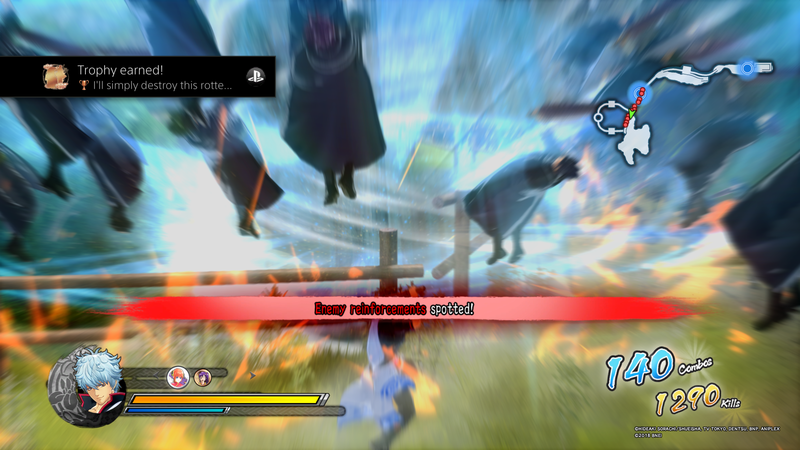 Needless to say, when I had the opportunity to play through Gintama Rumble on the PS4, I knew this was my chance. A feudal Japan, conquered by an alien race known as the Amanto. The samurai, once sworn protectors of the land, were betrayed by the shogunate, and have now been stripped of their swords. Now, it’s up to a small resistance, known as the Joui patriots, to reclaim Edo, and save humanity. It’s a unique story that paints a fun version of the samurai wars. Essentially, The Last Samurai with aliens instead of Tom Cruise (sorry, Scientology). Keeping true to the anime, right through to its final story-arc, are recreations of the famous battles throughout the series. If you’re a fan of the show, you’ll no doubt be able to follow along with ease and comfort. Though, if you’re like me, and haven’t watched the anime, you’ll be lost within the first 20 minutes. The game does its best to prefix each mission with spliced-in stills from the show to help with the exposition, but without a good foundation of what’s going on, you’re just left more confused than when the chapter started. Characters die…but then they’re not dead. Villains rise and fall all in a single cutscene, leaving you to wonder why they even introduced them in the first place. Names like Tetsuko, Takasugi and Tetsuya all used in the same sentence. What’s going on!? It left me a little disconnected from the experience, despite my best attempts to stay on track. As for the gameplay, let’s address the elephant in the room. This is Dynasty Warriors. A different (colourful) coat of paint, perhaps, but all the same elements of Koei Tecmo’s juggernaut Musou franchise. 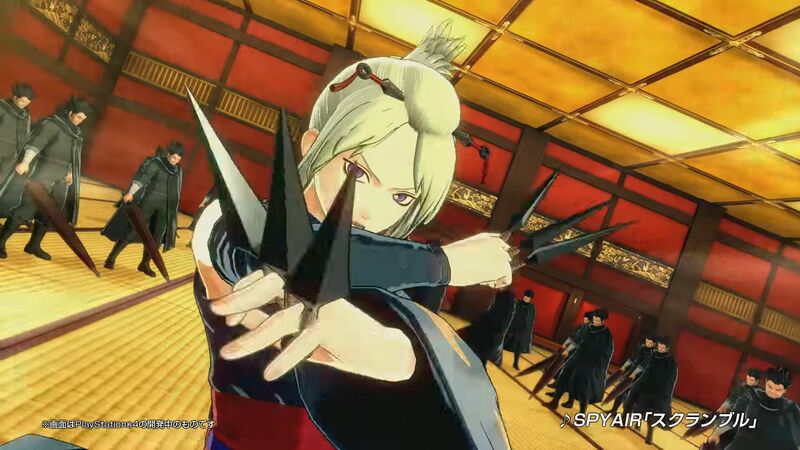 You play as several different characters: the samurai legend dubbed “White Demon”, Gintoki Sakata; the incredibly strong member of the Yato Tribe, Kagura (psst….she’s an alien); the kunai-wielding ninja master, Tsukuyo, and many more. With the help of SQUARE and TRIANGLE (Regular and Strong attack respectively), you’re able to mow down thousands of enemies. Coupled with the use of special attacks (my favourites of which include a full-on Kamehameha and a Kewpie Mayo laser cannon), and a metered, berserk-inducing ability called “Awakening”, racking up 4-digit combos should come frequently. At any point, your mini-map in the top right HUD shows where your allies and enemies are on the battlefield, and where to find the next camp to secure. It’s your standard recipe. To spice up the (slightly monotonous) hack n’ slash action is the Ginpachinko mechanic. Throughout the battle, either by achieving timed incentive goals (a la Final Fantasy XV) or collecting money, you’re able to play a game of slots. 3-of-a-kind yields some impressive powerups; health-restoration, invulnerability, experience boosters, and more! It was a smart move, and added a needed splash of strategy to the otherwise mindless fun of slashing through hordes of cookie-cutter enemies. Though, as enjoyable as obliterating thousands of scantily-clad ninjas with a psychotic, giggling alien-girl might be – the one-on-one boss battles are where the challenge lies. Evasion and parrying is just as important as slashing and….slashing, and you’ll need to be on your toes awaiting the next QTE to mash O. This is where I found myself most invested, as it felt less like a spam-a-thon, and more like a methodical (albeit fast-paced) samurai battle. Each of its 8 Chronicles (read: Chapters) has a series of missions, each with their own conditions for Victory and Defeat. Bonus “Achievement” conditions (defeat 300+ enemies, complete stage with more than 50% health, etc.) are also available, and will combine with your total Enemies Defeated and Elapsed Time to give you a Battle Results Rank upon victory. This means, more Experience Points! Experience points lead to more CP, which can be used to increase your Spirit, Skill and Strength (essentially, your stats). Further to this, Silver Orbs can be collected (or bought at the Edo Mart) and equipped with active and passive abilities, allowing for some pretty cool customization. This was one of my favourite parts of the game, that really elevated what could’ve been a pretty bland experience. The sense of progression through these RPG elements made it feel like the never-ending onslaughts had rewards beyond just getting to the next screen. Visually, the game looks great. Hindered slightly by the need to have so many on-screen NPCs, the game still feels faithful to its Anime roots. Perhaps most impressive, was the steady framerate. I don’t have much of an eye for dipped frames, but I fully expected a bit of slowdown with all the stylish swordplay and throngs of enemies. Props to Tamsoft Corporation for the balancing efforts that were needed to achieve this. The level design was also fresh and fun. Flying battleships, dojo mansions (which took me right back to the Crazy 88’s fight in Kill Bill), castle courtyards; a wide range of locales. It felt a little cramped and corridor-heavy at times, but for the most part, I enjoyed the change-ups, and didn’t really feel like I was in any one place for too long. Audio-wise, the Japanese voice-overs are fantastic…I think. They definitely sound like over-the-top, Anime voices…so…ya. The one small complaint would be the dialogue during the battles. While you’re hacking away, your characters is grunting and yelling out war cries, while having completely separate conversations with your main adversaries. I understand why they did it, but the tones of both dialogues clash, and it just further drains any sense of urgency to the grind. Musically, however, I love it! 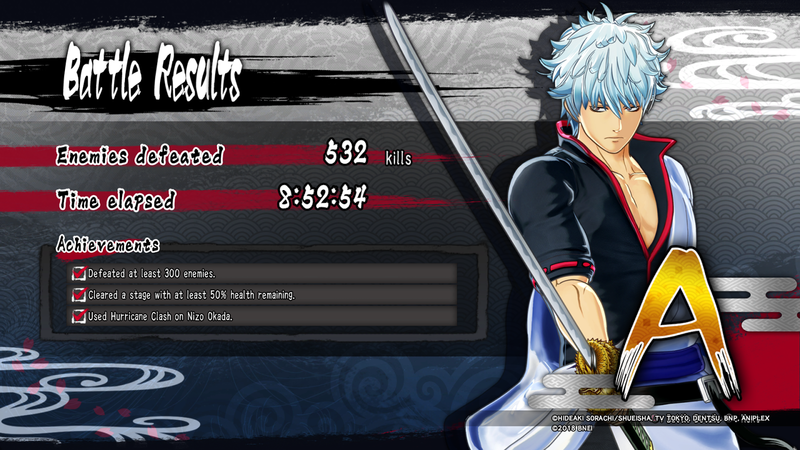 Gintama Rumble makes heavy use of the guitar riffs. It’s a common trait of these sorts of games, but works especially well with the sword-wielding, samurai aesthetic. Have a listen to the Menu Theme, and you’ll get a good sense of what the rest of the tracks have in store. I’d say, if you’re a fan of the Musou-genre of games, or love watching Anime, this is a great option for you. It’s a satisfying romp through the bizarre and zany world of the franchise, with a healthy dose of comedy and some tried-and-true mechanics. If you manage to put in the necessary 20+ hours, the ending, in particular, is quite enjoyable. But if you’re new to this style of game, and want a more familiar approach, both Hyrule Warriors and Fire Emblem Warriors may be better alternatives. Once you’ve given it a try, would love to hear what you think. Stop on by the Cartridge Club forums, and share your thoughts!